The common purified water is of macromolecule group water with acidity, none of mineral element. The nanometer activated water is made up of macromolecules group, with negative potential, & of alkalescence. 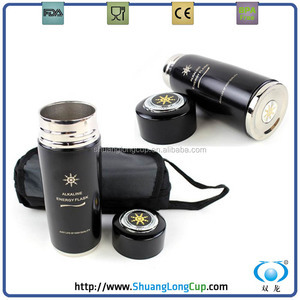 Nano water cup: Drinking mineralized water is the best way to be more healthy and beautiful. 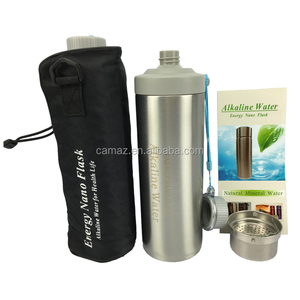 7 YRS Guangzhou Camaz Health Care Co., Ltd.
Silvery Stainless Steel 850 ml Alkaline Water Energy Nano Flask Features Specifications: 1. Regulating the body acid-base balance and resist the formation and growth of cancer cell. 2. Reducing blood lipid, Lower blood pressure 3. Improving regulation of gastrointestinal function 4. Promoting hunman metabolism, and enhance human immuity. (please use the hot water with the temperature above 90, wait until the hot water be cool, then repeat to wash it at least for 3 times) 2. Pour in the water, and wait for about 10-15 minutes. Best quality control and service, Abundant supply ability. Welcome to inquiry , welcome to visit our factory. If you are interested in our products, pls feel free to contact us at any time! Thank you! 3. Energy water with small water molecule clusters (H20) are easily absorbed into the bodys cell. Its high solubility effectively enhance the absorption of nutrient to the body. Feathers: 1. Its available for 5000 cups, after expired, the energy stone cant be replaced easily. 7 YRS Yiwu Weilai Commodity Co., Ltd.
8 YRS Jinhua Sinaier Industry And Trading Co., Ltd.
4. The negative potential can eliminate the excrescent free radical. 7. Neutralize the acidic toxin in the bowels, eliminate the dysporia. With water in the mineral water flask, it will create OH and O-2 that provides anti-bacteria function ( e. G.
2.Alkaline water: Make the drinking water to be alkaline, neutralizes human bodys acidic substances and keep balance of the body system. 3.Negative potential water: Normal water will be adjusted to be negative potential water with an ORP below than -200mV in about 3-5 minutes. 4. Add beneficial microelements: Various natural mineral substances are set out which provide body with necessary microelements and improve every organs to grow healthy. 2 YRS Wuyi Yuquan Stainless Steel Products Co., Ltd.
We produce quality products to meet international needs depending on our advanced facility and strict management. 2) Skilful workers care every details in handling the producing and packing process. 3) Quality Control Department is specially responsible for quality checking in each process. 5 YRS Yongkang Jianyang Metals Co., Ltd.
2) Vacuum interlayer, heat insulated; keep liquids hot and cold for 24hours at least. 5) Polish or color painting outer finish, we can do any color for customer&rsquo;s need. 6) Silk screen printing, embossing, stamping, lasering logo, all of them is available. Take hot tea or coffee with you up the mountain or cold water or beer to the beach. 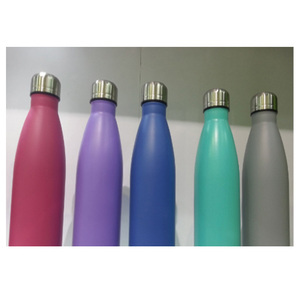 our bottles are made to last and can keep your beverages hot or cold based on your usage needs. 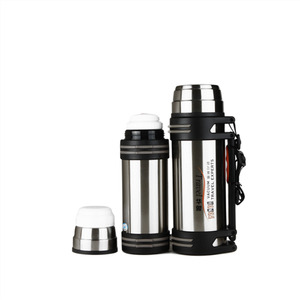 Take hot tea or coffee with you up the mountain or cold water or beer to the beach. 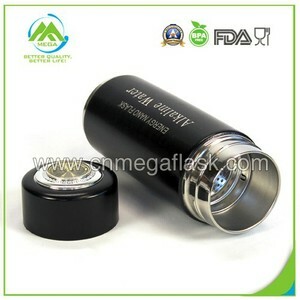 Alibaba.com offers 1,265 energy flask products. About 44% of these are vacuum flasks & thermoses, 13% are water bottles, and 9% are cups & saucers. 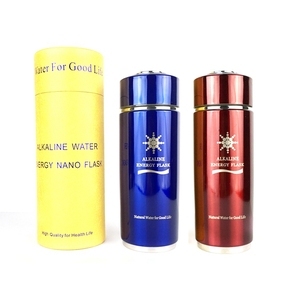 A wide variety of energy flask options are available to you, such as free samples. There are 1,265 energy flask suppliers, mainly located in Asia. 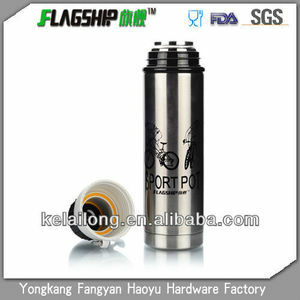 The top supplying country is China (Mainland), which supply 100% of energy flask respectively. 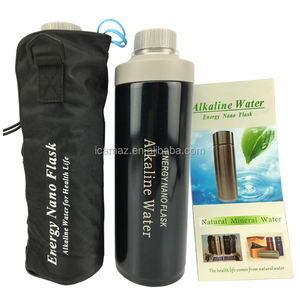 Energy flask products are most popular in North America, Northern Europe, and Western Europe. You can ensure product safety by selecting from certified suppliers, including 187 with Other, 115 with ISO9001, and 54 with ISO14001 certification.